This thermally efficient aluminium horizontal sliding window is an evolution of our original slide window system. It still offers the signature slim line profiles and minimal sight-lines often associated with this product. The new system features a modern larger thermal break, which provides consumers with both enhanced thermal performance and the option of dual colour profiles in a wide choice of colour finishes. This horizontal slider has been designed for use in residential and light commercial use - such as external serving hatches in restaurants. The system has high security multi-point locking and the option of a dual or triple track, with 2, 3 or 4 pane windows; all panels can slide. 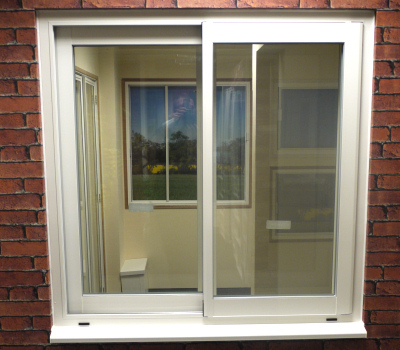 The triple track outerframe can provide up to a 2/3 opening with three sliding sashes. Glass units are secured using a wrap-around gasket with the sash profiles assembled around the sealed units, providing added security. Can be specified for residential (domestic) / light commercial applications. Standard Interlock is suitable for use on ground floor / first floor windows up to 1400mm tall. Medium Duty Interlock is suitable for use on the ground floor / upper floors on windows up to 1850mm tall. Heavy Duty Interlock is suitable for use on up to the first floor / upper floors and more exposed areas. Windows up to 2500mm tall. Min height for all combinations is 500mm. Max height is 1850mm. Styles are all viewed from the outside.